Kuwait, an Arab country on the Persian (Arabian) Gulf, has cultural heritage dating back to antiquity. 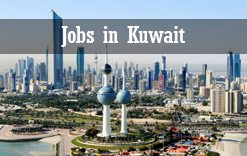 Kuwait City, the capital, is known for its modern architecture, ranging from skyscrapers to the striking Kuwait Towers, water towers whose design recalls the tiled domes of a classic mosque. The Tareq Rajab Museum houses a rich collection of ethnographic artifacts and Islamic art. For all above candidates should have relevant qualification and minimum 5 years experience as applied position. Attend Interview with Bio-data, original and copies of Educational, Experience certificates, passport and photos.